Today I reveal some of the dark, unsavory secrets of the audiobook business in its early days. To quickly review, audio programs have been around for a long time. In the days of LPs, you could find recordings of poets or famous authors reading excerpts from their own works. Perhaps someday Caedmon or whoever will reissue the beautiful recordings made by Gertrude Stein, Somerset Maugham and others (or perhaps they're already out there, I don't know.) And of course there were children's stories on those fun, multi-colored discs some of us remember from our youth. But audiobooks as we know them today didn't really exist, except for the Library of Congress' "talking books" that were only available to the blind and handicapped. It was in fact this program that gave some enterprising folks the idea to start producing unabridged audio programs for the general consumer as a way to pass the time sitting in traffic or during long business trips in the car. Basically, Recorded Books and Books On Tape were founded on opposite coasts in the late 70's. Recorded Books originated in Maryland and employed actors from Arena Stage in Washington D.C. This is where Frank Muller, the legendary late narrator, got his start. Within a short time they moved their studio to New York City and hired a host of narrators who were working for American Foundation for the Blind. Books On Tape started in Newport Beach, CA. They went a different route and employed narrators who worked from their homes. This kept overhead low and allowed them to reach out to talent all over the country. In the early 80's, an adventurous consumer might find a few abridged audiobooks in the bookstores, but addicts depended on a handful of audio publishers for unabridged titles, which you rented from the company or borrowed from the library, because bulky cases full of cassettes were simply too expensive to buy outright. For years, this was the core of the audiobook industry: rental and library sales. I should also mention Brilliance at this point. They attempted to end-run the problems of size and expense by producing four-track cassettes that played at half speed (similar to the Library of Congress tapes). You bought a special player that enabled you to listen to these. It worked after a fashion, but ultimately they dropped this in favor of standard cassette tapes. The thing was, you had to grow your catalogue very quickly in order to attract customers. So there was a huge push to record as many books as possible. All the titles were backlist, so a productive narrator for, say, Books On Tape, might receive boxes full of books every so often, and then proceed to narrate them at his or her leisure. I always had a shelf full of books waiting to be done. Pardon me while I pause to brush a nostalgic tear from my eye. You listened to the recording, heard a fluff, backed up to a good spot to edit, wiggled the tape back and forth across the playback head a few times to find a clean break without a breath or noise, marked the tape with a grease pencil, pulled it down to a splicing block in front of you, made a diagonal slice with a razor blade, and set the loose end aside. Then you had to run the rest of the tape off the reel onto the floor until you found the next good take. You made another mark,whipped the tape onto the splicing block, sliced it with the razor blade, found the OTHER end of the tape and pasted them together with a tiny piece of special adhesive tape. Then you moved on to the next mistake. You can see why this would not be an attractive proposition. I remember the time a famous actress came to the Library of Congress studio to record her own biography. She refused to do "punch-ins" but insisted the we just let the tape roll and edit out her mistakes later. Some time afterward, I asked the head of Quality Control how this had worked out. He turned bright red, muttered that there had been something on the order of a thousand splices, and said he didn't care of God came in to record the Bible, we were never doing that again. Also, those little adhesive strips could, under the right circumstances, eventually dry out and fall off. If the master reel wasn't stored properly or was exposed to temperature extremes, you might open that box ten years down the road and find yourself with several hundred random pieces of magnetic tape on your hands. Good luck putting it all back together. The second reason for punching in was that, even back then, high quality reel-to-reel tape was expensive. A 90-minute reel of Maxell tape could run $10-12 a box. So naturally you used both "sides," that is you recorded 45 minutes one way, flipped the tape over and recorded 45 minutes the other way. Then you'd dub this bi-directional master onto the two sides of a 90 minutes cassette. The point is, of course, that you COULDN'T splice anything, because in the process of chopping up one side, you chopped up the other! The third reason for punching in was that you needed very little, if any, post-editing. Basically, once you completed the project you were done and the book could be hustled to duplication and distribution. This was important for fledgling audio publishers trying to build their catalogues while keeping costs as low as possible. So "punching in" became more or less the norm. It's really not difficult to do once you get used to it. In fact, it helps to hear the end of the last sentence so you can preserve the same tone and energy. Now, a lot of the early home narrators got their training from various "talking book" studios around the country. It was very common for a narrator to double up as an engineer and proofer. So a lot of us learned to punch in on the engineering side. It involves all of three buttons, so after a few days of practice, you don't even think about it. I can't NOT do it--my right hand floats around looking for something to do--and I'm inclined to get impatient with an engineer who isn't "quick on the punch," as we say. Plus, I have a horror of leaving a mess behind that someone else is responsible for cleaning up. Speaking of messes--here's a dark secret that no one likes to talk about these days. A lot of the stuff--heck, MOST of the stuff--we home narrators produced was never proofed. There just wasn't time. And frankly, listeners weren't inclined to be too fussy in those days. The fact is, a remarkably high percentage of those recordings are still in circulation and you rarely hear a complaint about them. In fact, for many years I had a recording out there with a very bizarre error that I can't quite account for. Right in the middle of a narrative passage, I clear my throat loudly and say, "God, I need a cigarette." I have no idea how, with the punch-in process, that might have happened. My sole guess is that we took a break and, upon returning, the engineer simply hit record and we pressed on. The weird thing is that no one, not the publisher nor myself, heard about it until at least ten years after the recording had been released. It goes to show the high tolerance for error listeners had back then. Either that or the book was so boring everyone fell asleep before they got to that point. I don't know. Nowadays the standard is very different, and an audio publisher is taking a huge risk not QC-ing their recordings. One stumble and it's all you read about on Audible. Finally, a word about research. This, frankly, is a little painful to discuss. But you have to understand that before the age of the Internet, if it wasn't in Webster's, your chances of finding it were slim. You could spend hours on the phone with experts to find one little thing. I remember a name that cropped up in a book about Thomas Hardy that I simply could not figure out, so after numerous calls to the publisher and academics around the country, I managed to track down the world's leading expert on Thomas Hardy. I dialed the number of his university office somewhere in England, and a dry little voice answered. "Hellllooooo?" I explained why I was calling, and recited the name I was trying to pronounce. There was a long pause. Finally he said, "I'm sorry, I don't know." Feeling a little sick, I tried again, spelling it out this time, but after another long pause he said, "No, I'm afraid I don't know what that is." "Well," I said, a sense of despair washing over me, "can you make any suggestions?" He thought for a moment, then replied, "I should just leave it out." Today, with all the resources literally at one's fingertips, and given the level of most listeners' sophistication and knowledge, the idea of "winging it" through a book about ancient Greece or World War II is unthinkable. The Internet is a fantastic tool for narrators (and proofers as well.) These days, if you draw a blank on Google, you can be pretty sure nobody knows what it is or how to say it. Here at Blackstone, we recently remastered the recording of Shelby Foote's The Civil War that I narrated over two decades ago. This was a chance to right a wrong that had been weighing on my mind for years. I did a search of the text and found a few dozen names, places and terms I wanted to fix. I dug out my old microphone (never, never pitch them out or sell them, by the way) and recorded about 600 corrections. I am proud to say that the recording is now a far better one than it was before. I can rest easier. 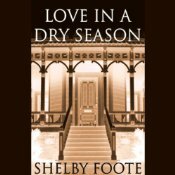 Speaking of Shelby Foote, I had the immense pleasure of recording not only his magnum opus, The Civil War, but his four superb works of fiction--Tournament, Jordan County, Follow Me Down, and Love In a Dry Season. It's astounding to me that more people haven't read them, because they are magnificent examples of the "New South" style. I adore them all, but if I had to pick one I'd opt for Love In a Dry Season. These were recorded for Blackstone as Tom Parker, and are available from Blackstone's web site or on Audible. Splendid post, Grover! I've been curious about the audio tech aspects for awhile. Very enlightening. Coincidentally, since you mentioned it, with this year's 150th anniversary of The Civil War, I have that Shelby Foote war opus in my TBR audiobook stack. I need to move it up now. "I should also mention Brilliance at this point. They attempted to end-run the problems of size and expense by producing four-track cassettes that played at half speed..."
Are you referring to the Brilliance Bookcassette here? Man, I remember those (and not necessarily fondly) -- I think I have BookCassette Adapter here in the house, somewhere.